Step 7: The production of the Regional Modelling Scoping Report. The purpose of Scoping Report 1 was to review the NTA roles and responsibilities (including policy development, scheme appraisal, integrated transport planning) and the consequent transport modelling requirements in each of the following regional city areas: The Greater Dublin Area; The Cork Region; The Limerick Area; The Galway Area; and The South-East Area (including Waterford and Wexford). A set of ‘NTA Needs-related’ recommendations. The RMS Scope 1 NTA Modelling Needs Review can be read here. 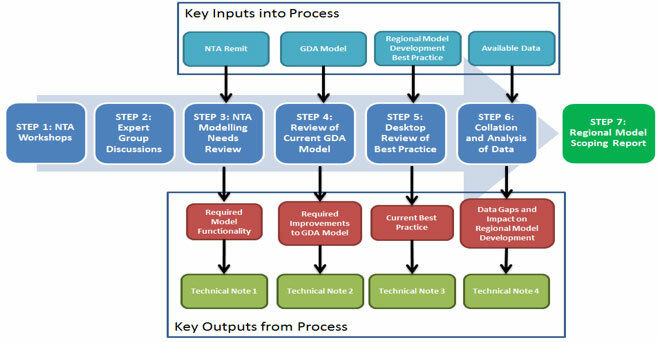 RMS Scope 2 describes the current GDA Model and assesses the model’s strengths and weaknesses relative to the list of key features and components that were recommended in RMS Scope 1 to meet NTA’s needs. RMS Scope goes on to make suggestions as to how any identified weaknesses should be addressed. A list of recommended enhancements required to address the key weaknesses identified in the current GDA Model. The RMS Scope 2 Greater Dublin Area Model Review can be read here. RMS Scope 3 reviews best practice modelling approaches to developing a typical regional model that would have similar functionality to the regional models that will be required by the NTA and which were recommended in Scoping Reports 1 & 2. The purpose of the review of best practice was to provide further guidance on the recommended specification for the NTA’s regional modelling system. Relevant models in Ireland, UK, US, Australia and elsewhere. The models and guidance that were reviewed together cover the required range of regional model functionality and complexity. The RMS Scope 3 Transport Modelling Best Practice Review can be read here. RMS Scope 4 reviews the data needed to support the development of a regional modelling system. It is intended to support decision-making regarding the scope and functionality of the regional modelling system and to inform future data-gathering initiatives. Data collated to date is reviewed and remaining data gaps are identified. Recommendations are made regarding how these gaps might be filled. In cases where data gaps cannot be filled impacts on the possible new regional model are identified. Medium to long-term data collection and data management issues are also considered. A summary of the main data-related issues and recommendations. The RMS Scope 4 Modelling Data Review can be read here. RMS Scope Report 5 is a non-technical summary of the regional model which describes the overall scoping process, the regional modelling recommendations, the regional modelling dimensions, the key components, an overview of the Regional Modelling system structure and the implementation of the regional modelling system. The RMS Scope 5 Non-Technical Final Report can be read here.